I actually got this romper a long time ago, but never wore it. I'd been waiting for the perfect occasion to wear it to, and then had completely forgotten about it until yesterday. I was desperately looking everywhere in my closet, trying to come up with something comfortable to wear and post about, when there it was, hiding behind some tunics. Isn't it the best feeling in the world when you find clothes you forgot you even had? I love the pattern of this romper. I paired it with a white blazer to give the outfit a more polished look. This is perfect for when you go out at night, and it gets a little cold. Have I mentioned how obsessed I am with chiffon blouses? They're just so lightweight, fresh and prefect for summer. Not only is this one chiffon, but it has this beautiful aztec print with bold, bright colors. I paired it with my white jeans and royal blue pumps. I noticed that the blouse had a bit of orange, so I went with my orange clutch to really make that color pop. I love the color-blocking with the blue and orange. Happy Monday! I've previously worn these pieces separately, but I love how they look together. They're two completely different shades of blue, from mint-green to royal blue. Since I was wearing bright colors, I decided to go with neutral colored shoes and bag. I wore my hair up in a bun to keep the chic vibe I was feeling in this outfit. Hope you girls like this look. Today's outfit is for the challenge hosted by Flor de Maria, Ashes into Fashion, and Nany's Klozet. So this week's challenge was to wear Spikes or Studs, and I wore both! Its just a couple of bracelets, but hey it still counts right? A while back ago, I would've never even tried on a spikes bracelet, let alone buy one. Spikes and studs are a little on the rocker side, but with the right clothing/accessories, they can add just the right amount of edge to a girly outfit. I kept it simple with a black and hot pink color scheme. I love the wraparound detail of this skirt. The clutch really brings the outfit together, adding some print, but allowing the skirt and accessories to stand out. I hope you girls like this look! As you can see, I'm kind of obsessed with dresses and wedges! They're my favorite for summer. I'm all about being comfortable while still looking feminine and this dress does both. I love everything about it, from the color, to the belt, to the open-shoulders. Today is officially the first day of Summer! A maxi dress is definitely an item every girl should have in her closet. They're so feminine and perfect for summer. You can wear them with some flat sandals and you've got a comfortable but girly look. Since I'm only 5'3, I had to wear mine with my wedges so it wouldn't drag on the floor. Its a simple dress, so I wore chunky accessories and a printed clutch to make a statement. What are some of your must-haves for Summer? I love wearing rompers. It looks like a dress, but its a lot more comfortable. 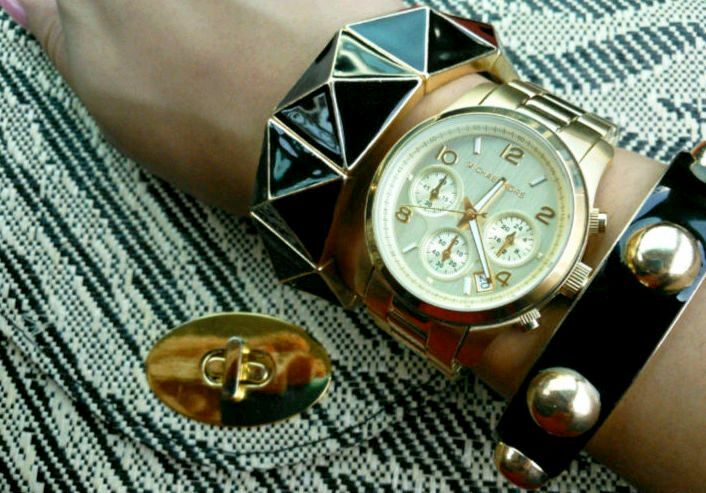 You just accessorize and your outfit is ready! They are an essential for those hot summer days. I really like the aztec print on this romper, and the color combination. You can dress it down with some flat sandals and a denim jacket, or dress it up with a blazer and platform shoes like I did. I've gotten into the habit of always keeping it super casual on Mondays. I like to just throw on a top and jeans. I've previously worn this top here. This top makes such a statement with the geometric print and bright colors, that you can pair it with just a simple pair of jeans and you're ready to go.